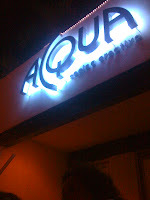 Last night the Critic and friends visited Acqua, that popular newish place on the stretch of commercial street that runs from Montejo, where Office Depot, Telas Parisina and SuperBodega (does anyone still shop there?) all stare at each other across the busy intersection; to Plaza Fiesta, one of Merida’s older malls. Look for the blue neon sign at night, next to the Louvre sign. The Louvre, famous for it’s tortas and the size of the large mutant rats in the space it once occupied, is a piece of Merida history, now out of its original location and plunked down in this part of town. The Critic and Co. sat outside, practically on the street, which was better than being inside because Acqua is a very noisy restaurant as previously noted somewhere; all the hard surfaces inside make the place reverberate with noice bouncing off everything. Also, outside you can still enjoy a smoke with your drink or after dinner coffee. The food on this occasion was quite good, lots of interesting combinations for the meats: salmon, shrimp, duck, Angus steak, boquinete; from panko breading to mashed potatoes w/ bacon, arugula lettuce, goat cheese, caramelized pecans and more. The portions are not particularly huge so don’t be put off by the idea of ordering an appetizer beforehand. You might try their chipotle fondue, which has a bit of a bite and gives everyone something to do while you wait for the next course. Remarkably, the service was better this time around, with the exception of the amount of time it took for the food to get to the table – it seemed to be an eternity but it was a cool night, the company was interesting and whenever the waiter did appear, he was very friendly. Drinks, ashtrays, that sort of thing. And he was also effective as a salesman, a waiter quality so rare in a Merida restaurant that it almost seemed out of place! He suggested ordering the apple pastry tart since it is baked fresh while you are enjoying your dinner and is served to you hot with vanilla ice cream on top (aka a la mode) . The party ordered 2 of these and, while not House of Pies quality, they did taste pretty good. Espresso macchiato after dinner was average. It’s nice to be able to order espresso in Merida; when the Critic first moved here things like espresso, salmon, actual brewed coffee, peanut butter were non-existent! The bill for 6 people came to 1900 pesos including tip, which at todays’ exchange rate of aprox. 14 pesos per dollar, comes to $135 USD. Time to Change your License Plates! Every few years, the government in the form of its’ state police, decides that all of us drivers need a little more stress in our lives and decrees that all license plates must be exchanged for new ones. Just because. This year, I decided not to do it myself, having just purchase a second hand vehicle (see photo on the right) that had a string of 5 invoices before my transaction, making the whole process that much more fun. The previous owner hadn’t officially changed the title of the vehicle, which was still in the previous (before him) owners name. All the tenencias were paid and up to date, but the vehicle had to be officially changed over to my name, as well as getting the new plates. So I decided to hire a tramitador, which is a guy that will, for a small fee, do all the footwork and arguing with the cerebrally challenged officials to get the paperwork through properly. He will also grease any palms necessary to make things smooth and relatively effortless, since the police department will make every effort to thwart your attempt to put in order your vehicles status. My day started the afternoon before, when I received a phone call from the secretary of a friend who was coordinating with the tramitador. She informed me that the next day I was to take my car to the ‘peni‘ which is short for penitenciaria or the former Merida penitentiary. I had already given her all my vehicles’ papers, and personal ID including passport and FM3, photocopied of course. At 7:30 AM, I was at the requisite location, found a parking spot and proceeded to find my man. I talked to him briefly (he was in the front of the line after having basically camped there since 8 PM the night before. You see, you don’t just show up and do your thing. No, you must get there early and since the entire state of Yucatan has to jump through this hoop, they assign a limited number of turnos in the form of numbers. Once you get your number, you are guaranteed to get in that day. Then you wait. He was Number One. He told me to hang around and at maybe 8-8:30 AM he would know something. So I waited. Thankfully the weather was cool and dry; the sun did come out but it wasn’t a scorching day in April by any stretch of the imagination. Food stalls were scattered around the police station and peni area, selling everything from cochinita to the usual Sabritas and other junk food. At some point, since he hadn’t called and my hunger was getting the best of me, I sampled my first food stall. This was the cochinita set up outside the peni, where one could order tacos or tortas de cochinita. I ordered torta de maciza (all meat) instead of the surtido, which is everything from bits of rubbery ear and chewy feet to sloppy innards and crunchy skin. The bread was slightly warm still and the roast pork was delicious, dressed with some pickled onion and with several spoonfuls of nose-watering habanero salsa to cut the fat content. Highly recommended. I then plugged in my iPod and listened to another chapter of Pillars of the Earth. At 10:30 AM my man on the inside interrupted the continuing saga of Jack, Earl William, Prior Phillip and Aliyena by calling my cell phone and informing me that I needed a telephone receipt to provide proof of my residence. I had included one in my name, but for my business. No, the police needed the one from my house. OK, I said, but I will have to get it from home, which is halfway to Progreso. I’ll wait, he answered. Off I went, along the always charming and traffic-clogged Jacinto Canek avenue to the periferico and on to the Progreso highway, to the house and then back the same way with the telephone bill from November beside me. At the busy periferico Jacinto Canek intersection, he called again and asked grumpily where I was; the police were getting impatient. I explained that I had had to go home, home was a ways away but that I was now on the way back. OK; but hurry, he insisted. I finally arrived again at the peni; no where to park so I just drove up to the door of the police station where you can’t park and he came and got the receipt. ‘You can’t park here’, he reminded me. It’s round, like a dinosaur egg, golden in color from the achiote, crispy on the outside and inside, a soft and exquisite blend of masa, pork and seasonings. Our friend Chino grabs one from under a towel-covered basket, stabs it with a spoon revealing its soft insides, and then slops on pickled cabbage and a thick tomato sauce. This is an amazing treat and I would go back to the police station just for this!! I also tried one of his kibis, but the flat, dry and somewhat flavorless crunch of cracked wheat was a let-down after the huge pibito. I then retreated to a shady tree to nurse my aching and distended stomach and listen to some more of the Pillars. At 1:30 PM I got the call. It’s time to come in and pay, said my man on the inside. Bring the old plates. In I went, the payment was made and in no time I had new license plates! After all that it was around 3 PM when I finally got home and had a nap to make up for all that exertion. The cost of his services came to a whopping (not!) $300 pesos. I paid him $400. Viva Merida!